Our look at classic Christmas songs continues with Baby, It's Cold Outside sung first by Esther Williams and Ricardo Montalban and then by Betty Garrett and Red Skelton in Neptune's Daughter (1949). Baby, It's Cold Outside has become a popular holiday standard, but it wasn't written to be a Christmas song at all. Composer Frank Loesser, best known for Guys and Dolls, wrote Baby, It's Cold Outside as a duet with his wife, Lynn Garland. The couple debuted the song at a 1944 housewarming party. It was a huge success and Loesser and Garland performed it frequently thereafter as a polite way to signal to lingering party guests that it was time to leave. 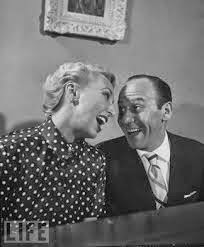 Lynn Garland and Frank Loesser belt out a tune for Life Magazine. In 1949, Loesser was writing songs for Neptune's Daughter, a musical for MGM's swimming sensation Esther Williams. The studio wanted a romantic duet for Williams and co-star Ricardo Montalban. Loesser originally offered his 1948 song, (I'd Like to Get You on a) Slow Boat to China, but the studio nixed the number because they felt it promoted an "immoral liasion." In a pinch, Loesser offered Baby, It's Cold Outside instead (Garland was reportedly furious that Loesser sold "their song" to the studio). Ricardo Montalban and Esther Williams in a publicity still for Neptune's Daughter (1949). Baby, It's Cold Outside is a duet for a couple, who are having a good-natured quarrel over how to spend the evening. One partner, known as "the wolf," wants to stay in and have a romantic evening by the fireside, while the other partner, known as "the mouse," wants to scurry off to other responsibilities. "The wolf" and "the mouse" can be played by performers of either gender and that's the way it's done in Neptune's Daughter. 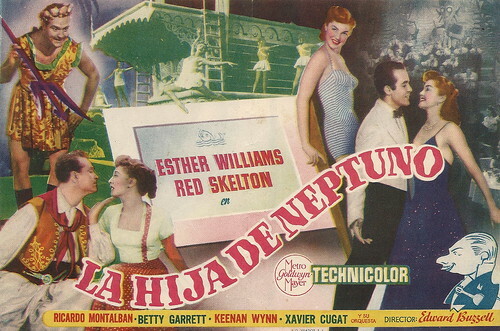 A Spanish language poster for Neptune's Daughter (1949). Baby, It's Cold Outside is performed twice in Neptune's Daughter (both versions are in the clip above). First, South American polo player Jose O'Rourke (Montalban) tries to persuade swimsuit designer Eve Barrett (Williams) to spend a romantic evening in. Next, Eve's man-hungry sister, Betty (Betty Garrett) pursues the girl-shy masseur Jack Spratt (Red Skelton). Baby, It's Cold Outside was an immediate sensation. It was recorded nine times in 1949 alone. First out of the gate was Dinah Shore and Buddy Clark (their version is above). There was also a country-music parody version with lyrics like "Dad'll get the shotgun down" by June Carter and duo Homer and Jethro ( below). Loesser won the Academy Award for Best Original Song and Baby, It's Cold Outside has rarely been out of the public consciousness since. It's become a standard Christmas tune thanks to its witty lyrics filled with wintertime imagery. The song was revived again in 2003 for the Christmas movie Elf, with Zooey Deschanel and Will Ferrell singing the duet. Sources for this article were The Songs of Hollywood by Philip Furia and Laurie Patterson and A Most Remarkable Fella: Frank Loesser and the Guys and Dolls in His Life by Susan Loesser.